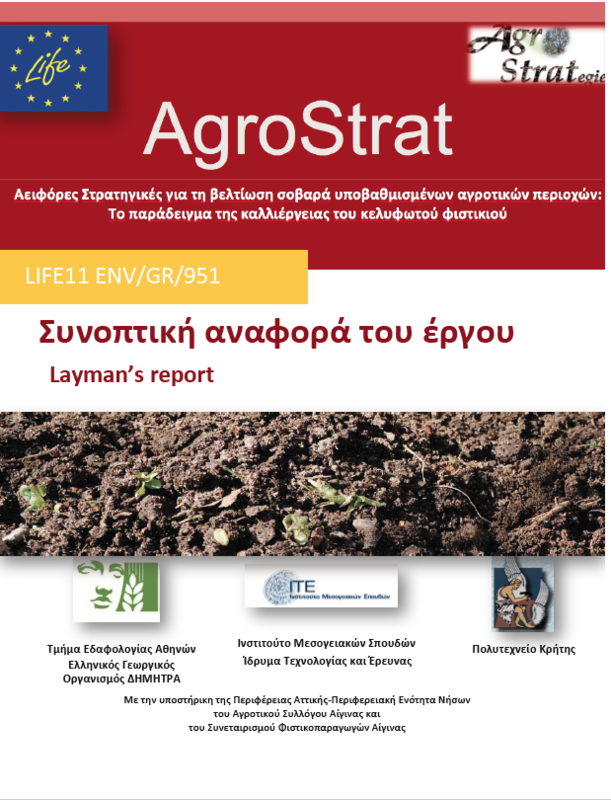 Three pilot fields, two in Aegina island and one in Kilkis, North Greece, were used for the pilot implementation of AgroStrat project. 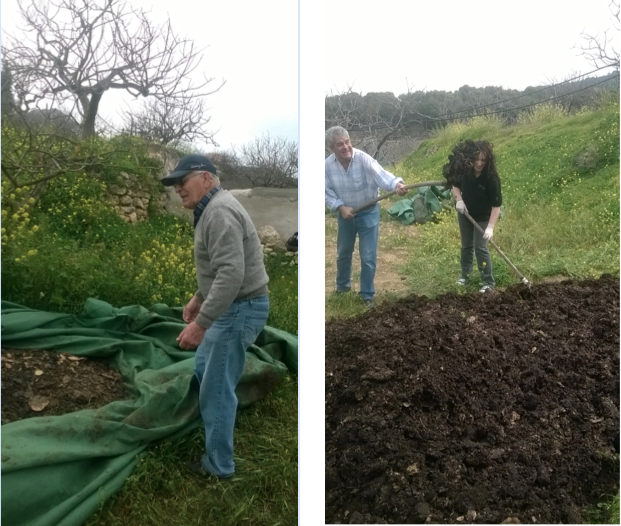 The difference between the two pilot areas was that for Aegina island there were available thematic soil maps as well as land suitability maps for waste reuse. Therefore, the CMS and the CMMT had available all the background GIS data for assessing land suitability and estimating the appropriate dose of waste or compost to be distributed on soil. 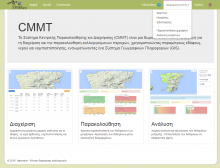 On the contrary for Klkis, no such soil data was existed in order to test the outcomes of the project without having uploaded soil data on the CMS and CMMT. Photos 1 show the location of this 0,1 ha field while Scheme 4 presents the IMaS as conformed to the 1st field. at fileld. 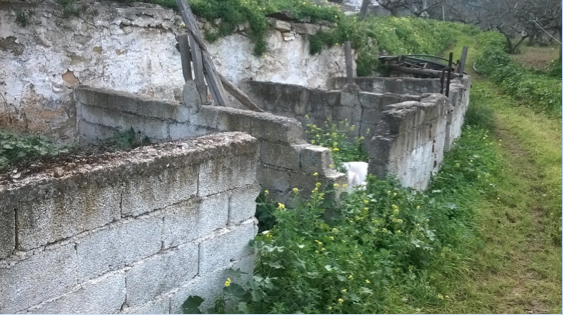 Fertilization consultancy and waste reuse on soil as provided by the Cultivation Management Software were implemented and evaluated. Wastes were separated into solid and wastewater immediately after their production by using a simple separation equipment (metal grids). 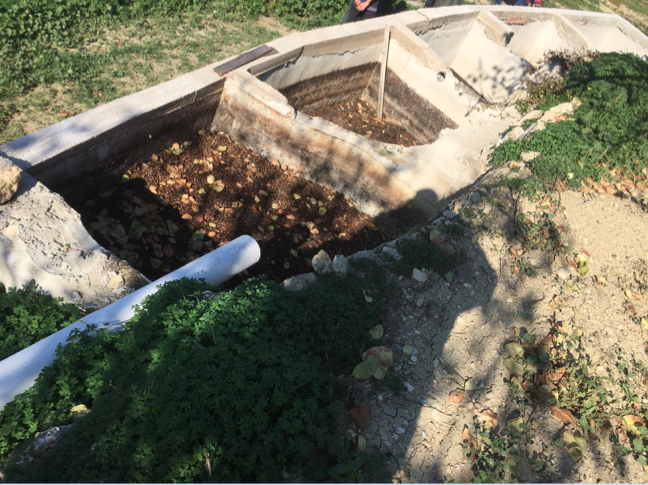 The solid part was collected and composted while wastewater was transferred into three shallow ponds (each of 5m x 5 m x 40 cm) and left to evaporate. Evaporation, given the Mediterranean conditions, was completed within 2 months. The system constructed was temporary. Protective media (geotextiles) were used to protect soil from infiltration of wastewater. Photo 4. Shallow evaporation ponds: Solid residue after wastewater evaporation (end September 2016). 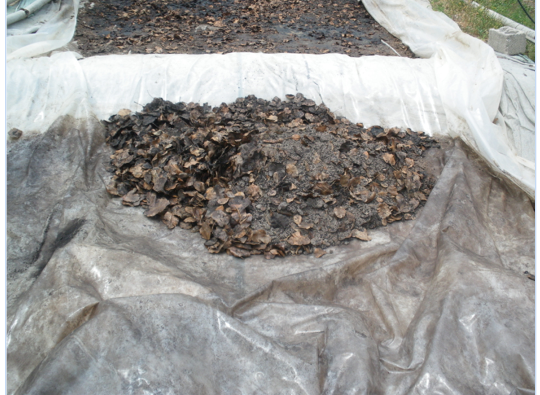 The solid waste part and the residues of the evaporation (photo 3) were mixed with manure, straw and zeolite according to the methodology developed by Agrostrat and composted. The pilot farmer by following the instruction given by TUC used part of the solid residues to produce biochar. Photos 7 show the location of this 0,1 ha field while Scheme 5 presents the IMaS as conformed to the 2nd field. The system was constructed by exploiting a former, almost destroyed, pig-breeding area, which had an initial inclination of 3% thus assisting transfer of wastewaters by gravity. The five stall places were reconstructed to form a sequential system of five reservoirs for waste collection. In this case, waste was not separated into solid and wastewater after production. Instead, the produced stream was directed into the five reservoirs; the transfer from the one to the next reservoir was accomplished through overflow. Wastewater was left to evaporate while the solid part was left to precipitate and then was composted. Photo 9. Collection of waste during pistachio processing (August 2017). Photo 10. The five ponds after wastewater evaporation (September 2017). Solid residuals were composted. 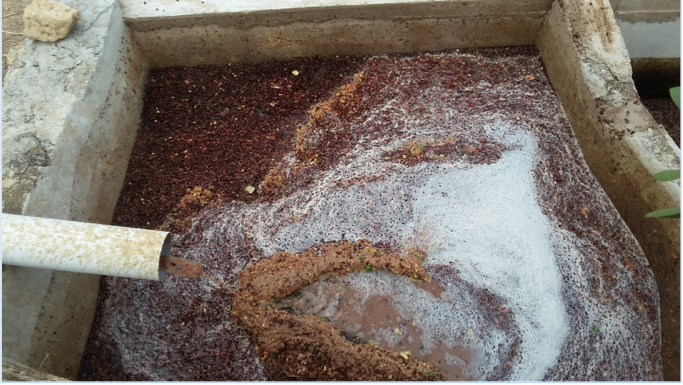 The residues of the evaporation (photo 10) were mixed with manure, straw and zeolite according to the methodology developed by Agrostrat and composted. Photo 11. 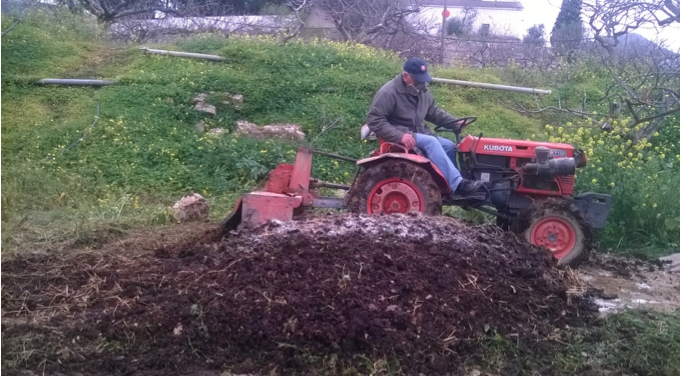 Field composting at the 2nd pilot field in Aegina island. Both waste treatment constructions are very simple and can be installed at any field, however for fresh nuts yield up to 40tn/field. This is because larger waste volumes are difficult to be managed by individual farmers themselves. Moreover, for larger productions a study need to perform as well as inclusion of mechanical or other technical requirements to bee considered. However, the purpose of the project was to provide small and smart solutions that can be implemented by the farmers themselves since it is believed that this can provide a solution for small waste amount, which are mainly disposed without control on soil and in water bodies mainly due to the non-effective monitoring by the competent authorities, exactly because it is difficult to monitor what is happening at field level. As regards the technical requirements, it has to be mentioned, that these are depended on the waste amount to be managed, the economic status of the farmers and also the already available means (e.g. equipment, personnel) at each field/small enterprise. Therefore, the requirements that are explained in this study concern the two specific cases of the plot fields, in terms of needed resources and means, regardless of they were available without cost or not. The respective costs for constructing and collecting waste at the reservoirs are seen in Table 1. Similarly, costs for composting 1 tn pistachio waste are seen in Table 2. For the 3rd field, located in Macedonia, there were no thematic soil maps and land suitability maps, therefore, it was no possible for CMS to estimate the appropriate dose of waste amount for distribution. However, all other services of the software were used, i.e. assessment of soil and waste quality by inserting chemical results, and receive consultancy on fertilization. Therefore, considering soil analyses and farmers yield targets, the appropriate fertilization program was provided to him. Due to low soil pH, the CMS suggested the addition of CaCO3 as a practice to improve soil properties. No other problems were observed in this particular field. As regards waste management, because the trees are young and therefore the production is lower than for the respective fields in Aegina, the waste amount produced annually was low. The farmer composted them (without the use of zeolite because there was no problem with electrical conductivity as in Aeginas’ waste) preparing a small pile. 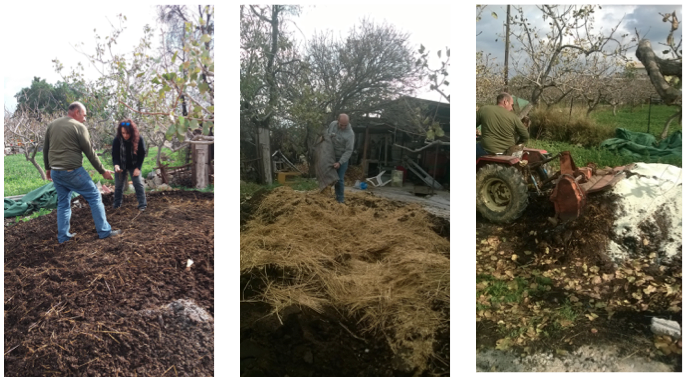 The compost produced (almost 20 kilos after maturity) was spread over a part of the field, to contribute to the increase of the low soil organic matter. Each year the produced compost will be spread on different field part, following a circular program.